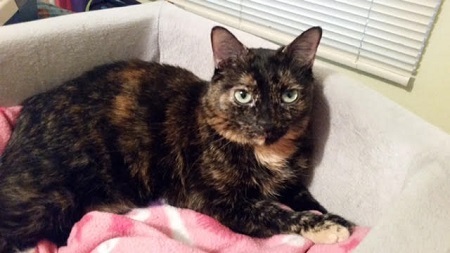 Cali is a 7 1/2 year old Manx tortoiseshell cat. She has been spayed and microchipped. She has lived indoor all her life. It is quite a sight to watch her tailess body as she romps around with her furry friend a 4lb chihuahua. Cali would probably do well in a home without children / large dogs and parents who are willing to give her the space while she is ajusting to her new home. Although she is not fond of being randomly picked up, she loves to be held and given snuggles on her terms. Cali loves her face and under her chin rubbed, as well as her back and sometimes tummy petted. She is liter box trained and has never had a accident. She likes to munch on her dry food, but is given a small amount of soft food 2 times a day. In the morning she is given 1/4 tsp of MiraLAX mixed in her soft food to keep her regular, one of the perks of being a manx. Unfortunately I have to move accross the states and will not be able to take her with me. I am seeking for a new home for my beloved furry friend.